HOW TO: Build your own Realm of Battle board for 20% of the price! Subject: HOW TO: Build your own Realm of Battle board for 20% of the price! 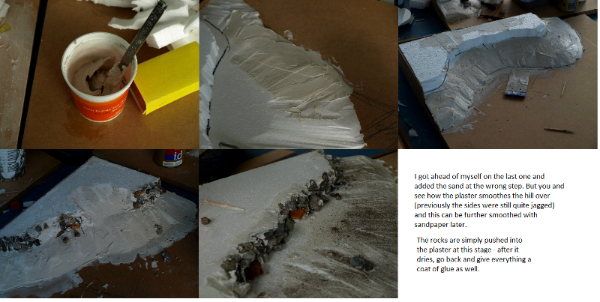 Hi everyone and welcome to my first attempt at a terrain tutorial. I chose this project to do, due to the release of the Realm of Battle Board by GW. Frankly, I was a little insulted when they released this overpriced piece of plastic. As our club's resident terrain guru I know exactly how much effort I'd need to put into making this board, and I can say that you can build an equivalent board for 20% or less of the price. In fact, I wager that I could build the board from scratch, buying the tools and materials, and 'paying' my hourly wage and STILL come out ahead of GW's board in pricing. Which is what I'm about to show you that you can do as well. •	The only time required is however long it takes to dodge the Redshirts trying to sell you Stormlords (usually 30-45 minutes). The home-built version will take you probably a weekend. •	It is lighter than my MDF construction. •	It is more portable and comes with a nylon carry bag with internal pocket (!!). However, in my experience, the amount of times I have needed to transport terrain a distance of more than 20m from my car can (just) be counted on one of my Tau's hands. •	It is more durable. I'll say now that I am doing this in Australia. I'll convert to inches/feet where I remember. If I forget and you can't understand me, it's your fault for being behind the rest of the metric world. Also, some things may be cheaper/more expensive/whatever, I don't know. Here, the RoB board costs $450, roughly equivalent to $350 US or 225 pounds given 2009 exchange rates - comparatively a regiment box costs $50. And the money you save making your own will allow you to buy actual terrain for your table. The Realm of Battle board isn't just AUD$450, it's AUD$450 + whatever terrain you buy from GW. Subject: Re:HOW TO: Build your own Realm of Battle board for 20% of the price! Always plan your terrain projects. I have a little worksheet that I plan everything with, even if it is just a rock on a base. Plans are awesome and keep your work to a minimum. 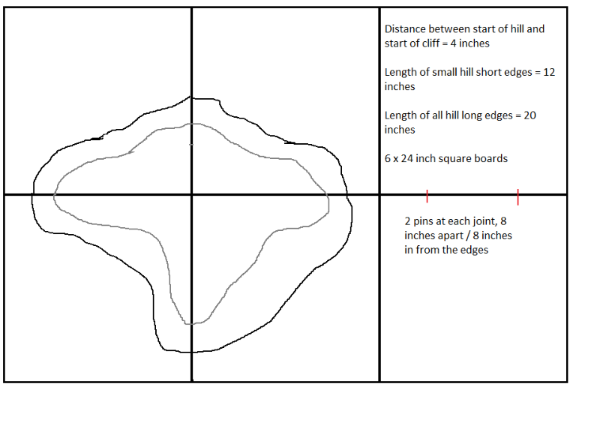 The RoB board has 6 2"x2" tiles, 2 of which are flat, 2 have short quarter hills and 2 have long quarter hills. The long edges are 20" long, the short hill edges are 12". •	6 2x2 MDF boards. I used 16mm thickness (5/8" or something) to match the rest of my terrain, though 12mm or even 9mm would work fine. Buy this as big as you can transport home, and cut it to size yourself. I would actually NOT recommend getting it cut at the store: this caused no end of hassle for me when things were cut too short. This will form the base-board. •	1 2'x4' 3mm (1/8") MDF board. This will be used to reinforce your hills. •	1.20 m / 4 ft of 8mm dowel - (or 6mm or 4mm depending on what thickness of baseboard you get). This will be used as pins to stop the boards sliding from each other whilst playing. •	2 2'x4' 25mm (1 inch) polystyrene sheets. Blue/Pink sheets are better, but very difficult to find in Australia. I just use the white beaded stuff. TIP: If looking for pink/blue stuff, search for 'Styrofoam brand' or 'Foamular brand' for better results. •	Filler. I use powdered stuff that I mix with water, called Polyfilla. This can be helpful to smooth out the hills. •	Bark, rocks and slate. For doing the cliffs with. A quick trip to Bunnings (my favourite local discount hardware / planet construction warehouse) netted me all the MDF, dowel, filler and glue for $75. The polystyrene I got twice the amount I needed for $25 - so put the cost to $13. I get my foam from Rockingham Foam + Upholstery, however, Clark Rubber is a national chain that supplies 2'x4' sheets and its reasonably easy to find a store near you. Bark and small rocks came from the local park. Assuming you don't have any of the following, and for some reason can't beg, borrow or steal them, you can get away with buying only a Jigsaw. Buy a jigsaw. They're fantastically useful. A hot wire cutter is near essential, and you can make one of these yourself for almost no cost. •	A jigsaw. The one i'm using was reputedly an expensive on in its day: perhaps because it ran on electricity rather than steam. You can buy something equivalent to this for $20 from KMart - although when I replace this one, you can get fairly decent ones from Bunnings from $35. •	Drill. Again, can be bought for incredibly cheap. Will be used to put the 'pins' in. •	Dowelling jig. Can range from $20 to over $200, aim for the cheaper end of the range. This device makes putting pins in so quick easy that it is almost essential for that stage, though you can skip it if you want to spend 10x the amount of time on that step. •	Some clamps. Don't buy these in plastic, and don't buy big ones you don't need. •	Pencil, Permanent marker, steel ruler, toothpicks. •	Plunge Router with mitre bit. Not strictly necessary, but I used it in the very last step to add extra details. Again at Bunnings, this would cost you $150 IF for some reason you don't know a single person who owns a single power tool. And really, it's an investment, and I really wouldn't chalk this up as 'price of my terrain board'. On the other hand, I only needed to buy a drill bit and some clamps, I walked away relatively unscathed for a mere $30. Wow that's probably the longest tutorial introduction ever, but I'm being thorough. Take your MDF board and cut it to size It's that simple. You want these to be 2ft square. I had to use 600x600mm, which is about half an inch shy of 'real' size. Considering that our current game tables aren't even straight along the edges this is a big improvement. Lay a straight-edge metal bar (or spare MDF board if you don't have any handy) along the back. Place 2 spare pieces of timer/MDF 2 ft apart with one edge on the guide at the back. Clamp a guide on top of these pieces, leaving such a distance between the forward edge of the guide and the closest edge of your cutting blade that the distance from the metal bar to the saw is exactly 2 ft.
You'll notice I'm using earmuffs (always a good idea when working with power tools), and a filter mask. You don't need to go that fancy with a filter (a cheap medical-style mask is fine) but its a good idea to not breathe in MDF particles. Also, a circular saw makes the cutting easier, but a jig-saw is perfectly fine. Then use your nifty dowelling jig to perfectly place the holes. I highly recommend this tool, it cuts so much time down its unbelievable. Simply line up the notch on the jig with the mark you just made: make sure the depth is set correctly: and drill into guide. I would also recommend using some tape or rubber band around your drillbit to make sure you don't go in too far. If you DONT splurge on a dowelling jig, make sure you measure precisely how far down from the top face you need to drill. Use a very small drill bit (2mm or so) first to 'pilot' the hole - mistakes made with the small bit are easier to fix than mistakes made with a large one! It helps at this stage to mark the upper face of each board. Just write UP on it in permanent marker. That way you know which side to stick everything to and you don't get height differences between boards later on. Third step is to cut your dowel to length. Before you cut it, give it a sand with some rough grit sandpaper. Do this to make sure that the dowel will slide easily in and out of the holes you just drilled. They still obviously won't have any lateral movement, but taking them out can be a pain otherwise. Cut your dowel to lengths of 2x your drill depth, with the jigsaw. My dowel length came out at 50mm (2 inches). Seeing as i make my terrain with the white polystyrene, it can take a beating sometimes. I like to reinforce all of my bases and sides of quarter hills with MDF board so that it doesn't chip away. I set up another cutting rig and cut 8 strips of 5cm (2 inch) tall, 3mm thickness MDF. I then came up with a rough design on one of them for the silhouette of the hill: I called this one the master and used it to trace out the same design onto the other boards. Then it was a simple matter of using the jigsaw again to cut these designs out. You need to cut 6 lots of the LONG side, and 2 lots of the SHORT side. Then, select 2 of the LONG pieces, and trim 3mm off their back edge to get the LONG MINUS 3 piece. This is needed so that when you join the 2 sides together, you don't get one side longer than the other. 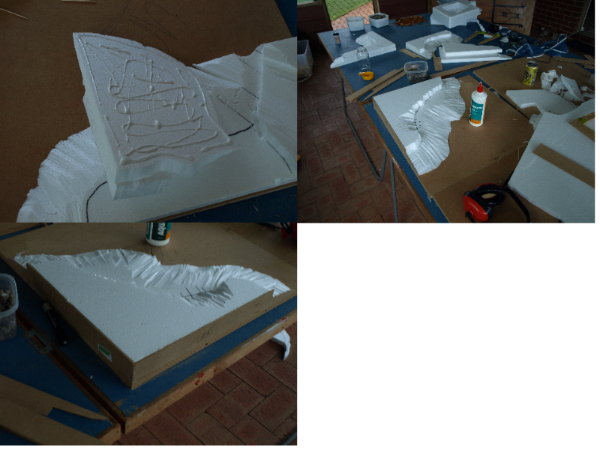 Keep your master piece and use it to trace the outline onto the edges of a piece of polystyrene. Due to the design of the RoB board, I built up both layers of the hill separately: one larger layer of which the majority was gently sloping hillside, and a smaller, higher altitude layer which had most of the rocky cliff faces. They say a picture says a thousand words. That means 9 pictures, plus some text explaining it... WHAT!! OVER 9000?! 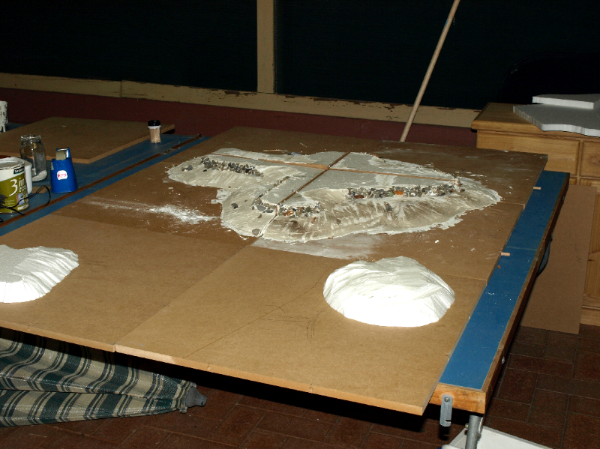 1) Trace the outline of the base of the hill onto your polystyrene sheet. Use your templates for the sides to make sure they have the correct length. 2) Cut this out with the hot wire cutter. If this is your first time using a cutter, they are amazing, but it might be best just to play around with a few scrap bits of foam to get the hand of what speed you need to move at and how to do the cuts. If you make the hill too big, you'll probably need to cut it in half and join in back together later. Instead of just doing a straight cut out to the edge, cut a little jigsaw-type divvy (see the hill in pic 6) that will let your pieces line up easier later. 5) Cut it with the hot wire cutter. One reason why I made my scrappy cutter was to get one with a wide enough mouth to do shallow hills. You'll find that small cutters really won't work for shallow angles: find either a hot knife, or make your own . 6) Use the hot wire cutter on a slight angle to cut gently it into a gently sloping hill. Anything less than 30 degrees is good: any more and models start falling over. 9) And number 9 is the end result you're aiming for. Use your next bit of polystyrene sheeting to cut out the tops of the hills, after you get a rough idea of what sizes they need to be. By now you should have the hang of using your cutter, so I shouldnt need to explain how to get these shapes. 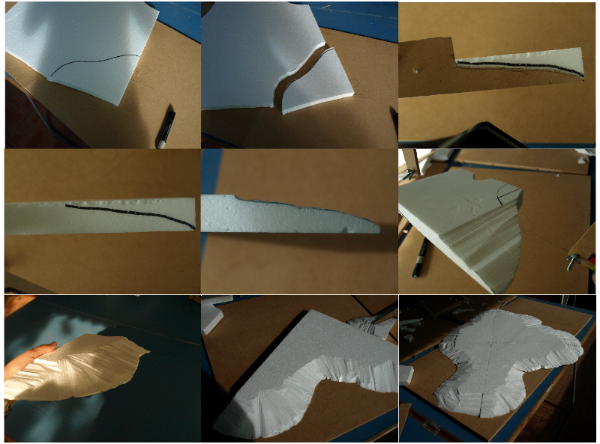 You can see how I made up the top layer with scrap pieces of polystyrene that don't fit exactly together: we'll fix that later, but i ended up using only one and a half sheets of polystyrene, giving me more for other projects. You can also see how i used toothpicks pressed through the polystyrene to hold it all together for this photo! Next step: glue it all to the baseboard. This requires lots of that white PVA glue, and some heavy/immovable objects are useful for keeping the MDF sides upright whilst gluing. But then again, you've been gluing stuff since you were 4 years old, you shouldn't need a tutorial on that! You can see how the MDF panels we cut earlier are stuck to the outside edges of the hills. This serves 2 purposes. 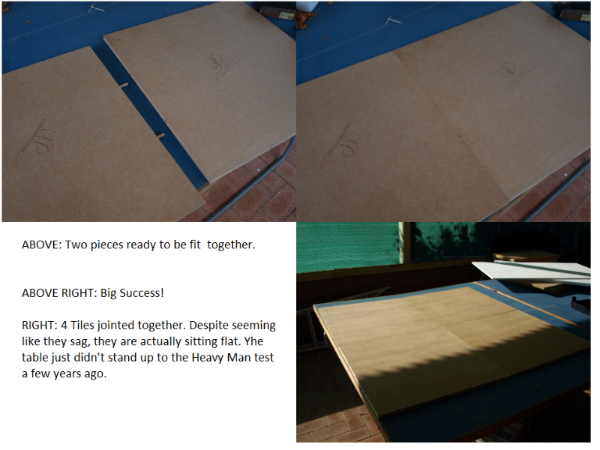 2) It makes sure the sides meet smoothly and evenly when you put the boards together. Next step is to use the filler plaster to smooth out the hills. Mix together your plaster in some plastic or glass container with an old knife. This cup cost me $50 from the casino (if you get my drift), but an empty jam jar is fine . Make sure you follow the mix ratio exactly - i've been a victim of wanting to add too much water to mine which has had disastrous consequences. Then use either a small scrap piece of MDF or a cheap plastering scraper ($1 each from Bunnings) to smooth it over your hill. The plaster I use sets hard within 1 hour (well, 30 mins in summer or 2 hours in winter) so there is plenty of time to work on it. Do one hill at a time, so you don't waste any filler. At this stage, I add rocks and bark to the cliff so that the plaster sets over it. Use your favourite rock-imitation material. I'm not overly happy with the finish on mine and may redo it with slate or cork. But you get the general idea of what needs to be done. Once the plaster is dry, you can sand it back smoother. 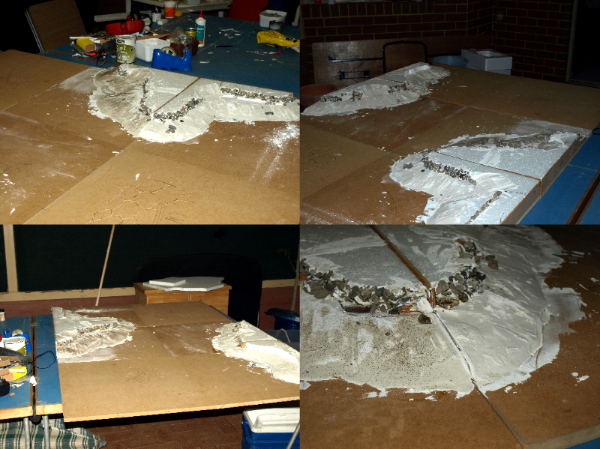 My last step was to give the entire hill section a coat of PVA glue and a light sprinkle of sand. This is where I use the plunge router. This is just adding extra detail that can also be recreated using thick card. I like using the router tho as it 'sinks' the terrain in, giving a perfectly flat finish. The coolest feature of the GW Realm of Battle board, in my opinion, is the rocky terrain in the ground. I wanted to recreate that on mine, which is a little difficult as everything is made from reasonably sturdy MDF. However, there is no problem that cannot be solved by precise application of more power tools! First step was to trace on the board the rough outline of the stones I wanted. The board will probably end up with lava flowing in the cracks to match my chaos army (but that's another article). I made sure to have plenty of big stones, and very small stones where they meet on the ground. You could possibly adapt this method to drawing designs of paving stones or something similar. Next, I turned on the router, pushed it down and traced over all my drawings. The result? very small channels criss-crossing the board, in the shape of stones. I used a router with a 45 degree miter bit (ie a pointy cutting bit) and a plunge range between 0-~2mm. You can see how the channels differentiate between the rocks: when painted it should come up nicely! I'm only going as far as completing the actual baseboard here; after Uni exams are over I'll update with a painted version. So I quickly made two boards, each with a single stand-alone hill. It is really that easy to add more tiles! With the GW board I'd need to spend another $450, for identical tiles : you now have infinite customization and possibilities. I hope you found this useful! Soon I'll write a tut for Making your own Hot Wire Cutter and painting this 'Realm of Battle' board. and there are no ridiculous piles of skulls! YAY! great use of the router. Awesome! This looks really good and something for me to try during the summer holidays! Power tools are actually amazingly cheap. The most expensive bit to buy would actually be the dowelling jig (I saw one in Bunnings for $200.. of course there was also one for $20 too). K-Mart stocks a small range of cheap power tools. You can get yourself a Jigsaw and a Drill for ~$20 each (Australian - given current exchange rates thats about 10 pounds). Don't know what the Euro or British equiv of KMart is. A variable plunge router like mine is reasonably expensive, upwards of $150 around here. You can get small 'trimmer' routers that don't allow the depth to be varied as you're going, they cost $70+ from Bunnings. You could probably do the same thing with a Dremel if you wanted to. The circular saw I just used for speed, exactly the same job can be done with a Jigsaw. Materials: 1 old transformer (12v 1 amp Output, think it came from a speaker set. Old mobile phone chargers work as well. You can buy a variable 3-12v 1amp transformer for $30 AUD here, but why bother? $5 all up. bash it together. Considering i spent about $90 on the game board ($55 MDF, $15 Plaster, $10 Polystyrene, + small extras) I could then go buy myself a decent drill and jigsaw ($40 each) a good router ($150), make a Hot Wire Cutter ($5) and STILL be $100 ahead on Games Workshop's price. Add $10 per hour at minimum wage and I could take a day off work to make this and still break even. As for the skulls: I'll see if I can come up with a way to reproduce skulls. Will probably heavily involve a router and greenstuff, but anything can be done! One question though:The gaming table that GW sells is stored in a padded bag...how do you store your table when it's not in use? It seems like the topographic features would make it difficult to stack. Because all the hills are the same height, you can turn one upside down and put it on top of another and they stack nicely. At the moment it lives under my bed. But exams are over, so its due for some paint and some flock this week! Hmm, where do I start...? Product : Realm of Battle ported successfully into Realm of Budget. Looks like a pretty accurate copy of the original (skull pits notwithstanding, but I'm not a fan of those on the original anyway), so mission accomplished so far, but I'd have to give it a temporary 9/10. "The Emperor Protects - And having a loaded Bolter never hurt either !" - Proteus and Pythor, Ultramarines, The Movie. Looks amazing! My friends and I build a board kindof in the same way just not with the hills and such. Looks great! Any chance of seeing the table all painted up nicely? I've just come out of uni exams and, having sent the girlfriend safely out of the country on holidays, painting etc should begin soon. Can you think of a compelling reason not to try foam? I'm thinking of a combination of your tutorial and the lava table tutorial. I suppose the dowel holes might suffer over time. The way I see it, making terrain is a compromise between 6 factors: Looks, Durability, Playability, Cost, Time and Storage. No-one can say exactly which way is the best compromise for YOU. I figured that Durability and Storage were important factors for me: if I'd made it out of foam, it would be a lot taller and wouldn't fit under my bed!! I think I am going to do this using an insulation foam base board instead of MDF. I may try to reinforce the holes using some plastic tubing, or somesuch. I need to have a think about it. All foam boards will warp from being painted/flocked. They need some type of backing. Looks nice I did a similiar board recently with pink board, and it been great, painted it a quick black and am going to flock and paint again soon. Using the pink boards and a kitchen knife, I was able to create the board for around $50 american. I got a bucket of sand from a local playground and am going to buy some more paint, so the total will go up about 15-25 bucks for paint. I bought my boards today and had the nice man at B&Q cut it for me. I decided to get enough bits of board to make up 12 bases now and make them fit properly, but only decorate four or six of them now and do more later. Luckily, nice man at B&Q was a pretty intelligent sort, so my two 8x4 boards got cut into twelve almost exactly square pieces and four slightly shorter pieces, which can become either scenery of some sort, 1x2 road pieces or strictly paired crossboard pieces. That decision can be made much much later. My question is, how much "extra" wood beyond square did you find was enough to be problematic? I reckon the man has got to within AT LEAST 2mm of square in each case. Is that enough to be problematic? 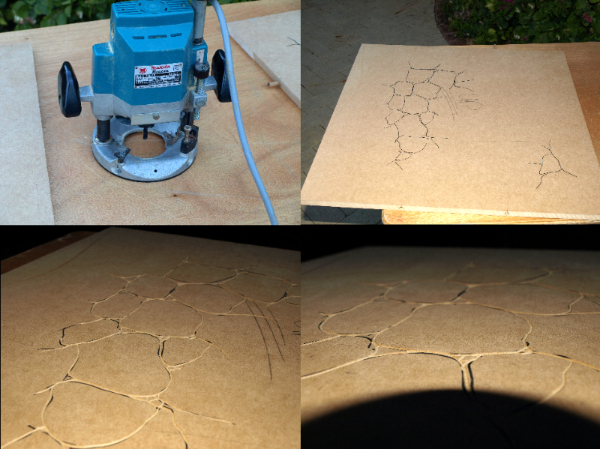 I'll be going into work (secondary school) and using the tech block next week to drill the holes for the dowelling, so I can be super careful about lining up the holes right. My boards were within 2mm of square. They were all the exact same dimensions one way, and the other way was slightly off. 2mm is about the maximum you'd want to be out. As for using smaller tiles, this gives a few potential problems. The biggest problem in my opinion is the appearance of a grid on your board. You never have to guess ranges again when everything is evenly spaced out in multiples of 6-12". The smaller the tiles, the easier it is to get exact distances from the board size. The other issue is modularity. Whilst smaller tiles can make for more board combinations, they also mean more work. The smaller you make your tiles, the more different TYPE of tiles you need to make. In my board, i got away with using 3 different board edges: flat, long hill and short hill. If you try the same with small tiles, you'll end up with very small hills! 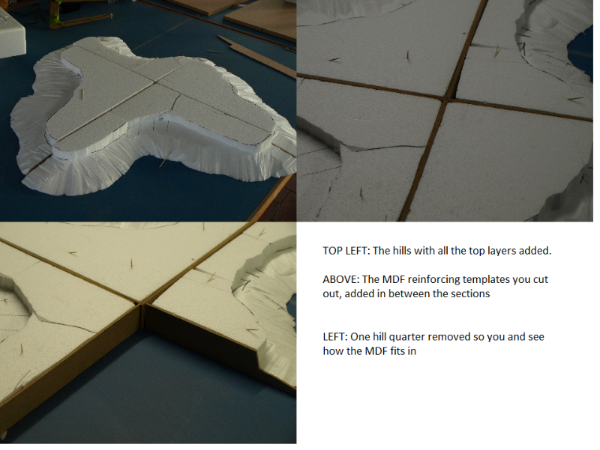 So if you want to make your hills longer, as well as having hill corner tiles like I have, you'll also need hill wedge tiles (one high edge, 2 sloped edges, 1 flat edge), hill Top tiles ( 4 high edges) etc etc. And really, for dowelling 2 dowels is plenty enough to hold them in place. They don't need to support weight: its just to stop sliding movement. Hell, even one dowell in the center would be sufficient.